The boys had recently been given some cookie decorating kits by their auntie, and as New Year’s Eve is approaching I thought making New Year’s Cookies would be the ideal activity to keep them busy for a while on such a cold and rainy day. 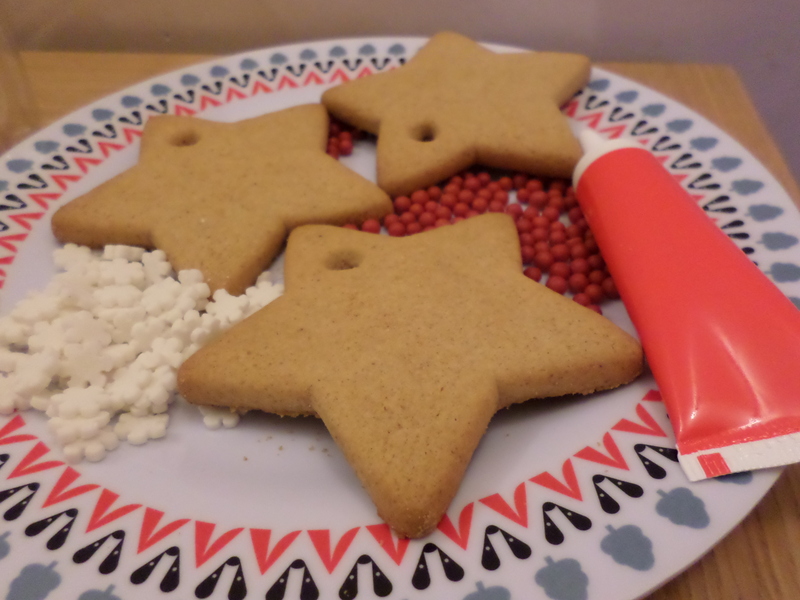 Our kit had star shaped gingerbread cookies, the perfect shape for any celebration. Of course you could make your own too. 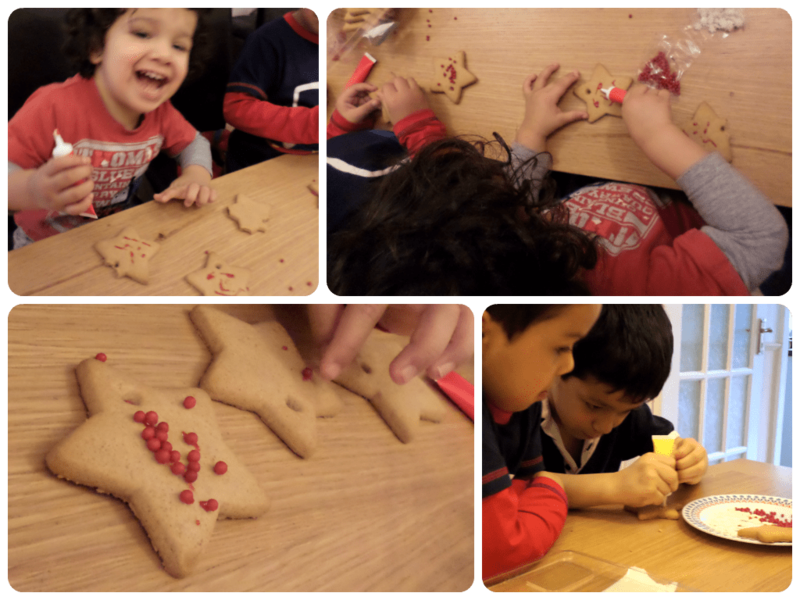 We had red and yellow icing to decorate, and star/snowflake shapes, and round red balls. Gold or silver balls would be lovely for a New Year’s theme too. If you are looking for more fun ideas for kids at New Year’s you could try these Firework craft ideas, which also links to Edible Sparklers and Firework cookies if you are looking for more food based ideas. 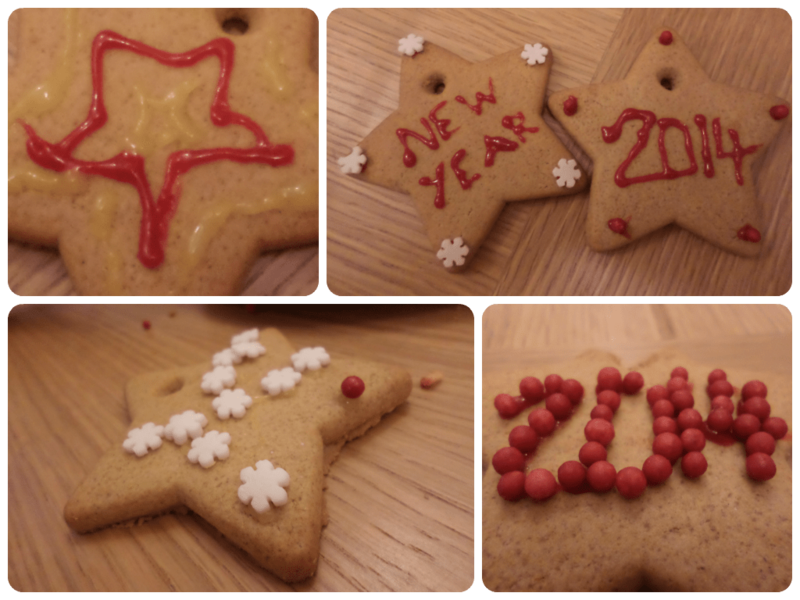 These look fun – my two love decorating biscuits too – always a great activity for children! I think we’ve only celebrated New Year’s Eve a handful of times.I think some baking is in order tomorrow. 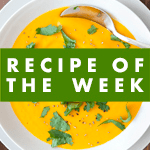 Mmm these look yummy, well done to your children. We had fun decorating a gingerbread house – now my eldest (8) keeps fielding enquiries about when we can eat it! What a lovely idea – hope you have a Happy New Year. Mari recently posted…15 ways to feel fabulous this winter! Helen Gandy recently posted…New York, New York!! What a great idea to get little ones involved in the whole New Year thing. Ours are too young to stay up so this is a great way to get them involved in the whole celebration…I might try and do this tomorrow with them! Thank you. Great idea for little hands! I have pinned this, I hope that’s okay. Beautiful – we did something similar before Christmas. Hadn’t thought about New Year cookies! It looks like they had so much fun. What a great gift! We have tried the gingerbread men that you can decorate yourself and Munchkin loves those. Will have to try these ones! Foz recently posted…Let’s get Crafty! Nice to see these cookies came out well and didn’t smash up before you got the chance to do them! That looks like great fun and very tasty indeed! Erika Holt recently posted…Like the Cheshire Cat! We have some of these to decorate that we still haven’t gotten around to doing! Looks like your boys had lots of fun! These look lovely! I think I will make them with my four this afternoon! Thanks for pin and tweet 🙂 I have already added to the next one! This is a great idea! All too often we think celebrating the New Year is an adult event, but this is a great way to include children and looks lots of fun too! Such a lovely idea to celebrate with kids.. Such a good idea to celebrate with kids ..